Several locations from northeast North Carolina and the Virginia Tidewater to Delaware and the Jersey shore have already picked up 6 inches of snow, including Wildwood, New Jersey, Stockley, Delaware, and Hampton, Virginia. Newville, Virginia, between Norfolk and Richmond, tallied 8.5 inches of snow. Snow was falling at the rate of 1 inch per hour at New York’s LaGuardia Airport, and 2 inches of snow was already on the ground at JFK Airport as of 7 a.m. EST. Local Deliveries in and around the tri state area have been slowed at the moment with most trucking companies electing to stay off the roads until the storm passes. Generally around an inch of snow had accumulated in many areas of the Washington D.C. metro. Wind gusts over 50 mph have been frequent Thursday morning from the Outer Banks of North Carolina to the Delmarva Peninsula. Overnight, some gusts over 70 mph were clocked in eastern North Carolina. Wind-driven rain was hammering Cape Cod, Martha’s Vineyard and Nantucket Island, with a gust over 60 mph already measured at Nantucket. 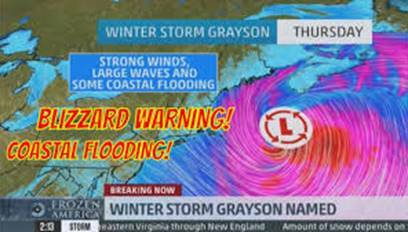 Blizzard warnings remain in effect for much of the coast from Maine to far northeastern North Carolina, including Boston, Portland, Maine, Atlantic City, New Jersey, and Norfolk, Virginia. Winter storm warnings have been issued to the west of the blizzard warnings, including much of the Interstate 95 Northeast urban corridor from Maine to Delaware. This includes New York City and Philadelphia. Rail and over the road trucking services can see disruption into the coming weekend as cleanup gets underway throughout the northeast corridor. Not only would this be one of the most rapid rates of bombogenesis associated with an East Coast storm, but its central pressure may bottom out in the 950s millibars, also among the strongest offshore storms you’ll see. We will continue to monitor the situation and keep you updated as time progresses.